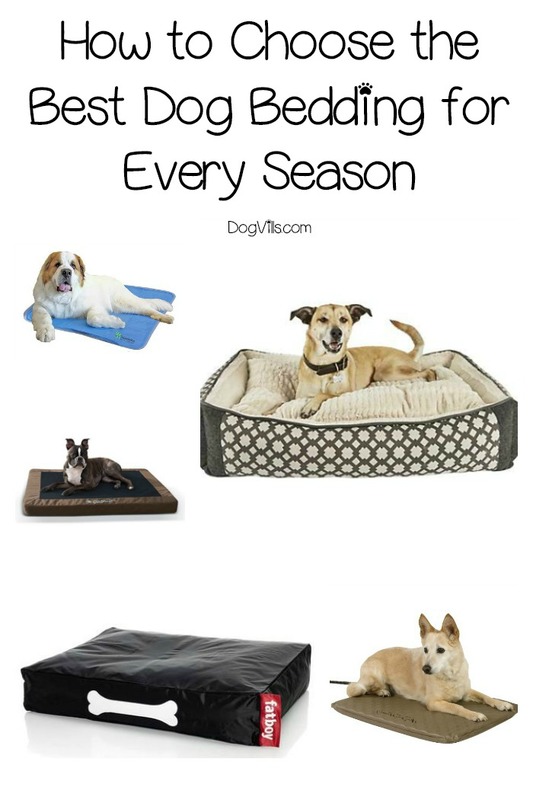 Looking for the best dog bedding all seasons? From indoor beds to the perfect bedding for a dog house, crate, kennel, from winter to summer, we’ve got you covered in our complete guide to choosing the best bedding for your dog! Read on to find out everything you need to know about how to choose the best dog bedding for indoors and outdoors! Making sure that your dog is cozy, comfortable and warm during the night is, for a good reason, one of the main concerns for dog owners. When my dog is not sleeping in my bed, which doesn’t happen too often, I like to know that he is still getting a good night’s rest. 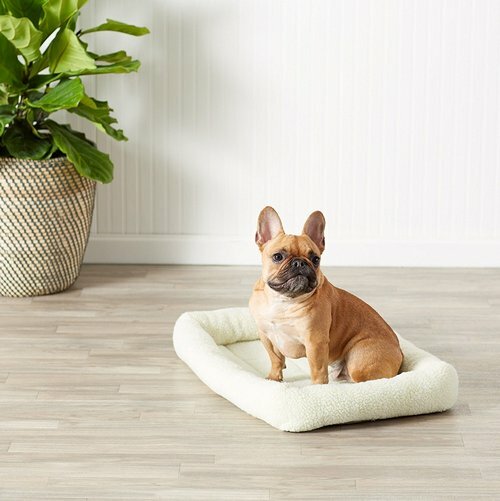 I know how much I struggled to find the best dog bedding because I had no idea what to look for, but with a bit of research I was able to provide my pooch with a nice bed of his own. You need to measure your dog’s weight so you can choose the bedding that is the right size for him, especially if you are thinking about buying a bed for him since most dog beds are sized by weight. If you are not sure how to determine the right bed size based on your dog’s weight, here is a chart to help you. The breed examples are just a guideline based on average weights for each breed. If your dog is within a couple of pounds of weight limits, you can go up or down a size, depending on your budget. For example, if your dog is 11 lbs, you can most likely still get away with an X-small bed. If your pooch is 24 lbs, it’s also fine to go up a size to give him more room. Raised beds are the exception, as they are often designed to hold up to a specific weight. While they mostly likely factor in a bit of leeway, I’d err on the side of caution there and go up to the next size. Buying the best bedding for senior dogs is a bit more of a challenge than getting a bed for a young dog. On the one hand, you want something with extra padding for achy joints. On the other, it can’t be too high off the ground or it will be hard for them to get into. Older dogs often suffer from arthritis and other medical conditions. If this is the case with your pooch, take that into consideration and choose bedding that has features that can help with his ailment. Memory foam is a great choice for dogs with achy joints! Choosing the right material can be tricky and depends on many things. First of all, you need to take your climate into consideration. That will determine whether you need a cooling material, like nylon fabric or linen, or something that will keep your dog warm, like polyester or beds stuffed with a reflective film. Another thing to consider is your dog’s shedding levels. If your pooch sheds a lot, choose synthetic microfibers such as microsuede and microfleece since they have small fibers that attract hair, keeping it all in one place. Linen is also a good choice for shedding dogs. Many dog beds are made using a mixture of materials. For example, fleece is usually combined with a more water-resistant fabric beneath it. If you have a dog with particularly sensitive skin, check the materials label to make sure the entire sleeping area is hypoallergenic. Does your dog sleep indoors or outdoors? If he sleeps outdoors, does he have his own dog house or not? These things will have a lot of influence on your bedding choice. For example, most dog beds are not a good choice for outdoor dogs because they will quickly deteriorate due to weather conditions. Also, blankets or other similar bedding choices will get dirty and probably wet very quickly and you will have to wash them often. Grass hay and pine straw are good choices for outdoor bedding, but they are not a good choice for indoor bedding unless you like to roll around in hay in your home. Hey, no judgment here. Beds or linens that are machine washable, waterproof or have some other additional features that can make your life easier or provide additional comfort to your pooch are always a good choice. Before you start your search for the best dog bedding, take a minute to sit down and write a list of the most important features. Trust me, it will come in handy when you’re staring at two equally fantastic choices and trying to decide which one to get! A word of advice for those thinking of adding “indestructible” to the list of must-have features: don’t. You will never, ever find a 100% indestructible dog bed. Ever. Unless it’s made of cement, and even then, I have no doubt that some dogs would find a way to destroy it. You can, however, find super durable dog beds that are harder for your destructive pooch to eat! Harder, I said. Not impossible. Let’s be honest, even though price shouldn’t be the first thing to consider when looking for the best bedding for your dog, we all have budgets that we need to take into account. Some options are simply more expensive than others, so choose the best bedding for your dog in accordance with your budget. Don’t buy your dog a luxury, expensive bed at the expense of paying your electric bill. Now that you know what things to consider when you choose dog bedding, let’s take a look at some of the best available options. Dogs that sleep indoors don’t need to worry about being cold, but you still want your pooch to be comfortable. There are many options to choose from when it comes to indoor dog bedding, from simple blankets, towels, sheets or even old clothes as the more economic options, to a duvet, a mattress or a bed, which is the most popular (and probably the best) option if you can spare that expense. When it comes to comfort, not many options out there can beat Fatboy lounge bean bags . This is a very durable bean bag that can withstand a lot of bites and scratches from your pooch. The cover is made from strong nylon, which is a great way to give your dog extra warmth during the night. It is also water and stain resistant, so you don’t have to worry about permanent stains on the cover. The nylon also keeps smells away. The bag is filled with virgin polystyrene beads and it is very thick. You can get your bean bag in two sizes: small (24 inches long by 32 inches wide by 8 inches high) or large (48 inches long by 32 inches wide by 8 inches high). You can also choose from many vibrant and engaging colors. The cover is machine washable while the bag itself is easy to clean with a bit of mild soap or warm water and a damp cloth. 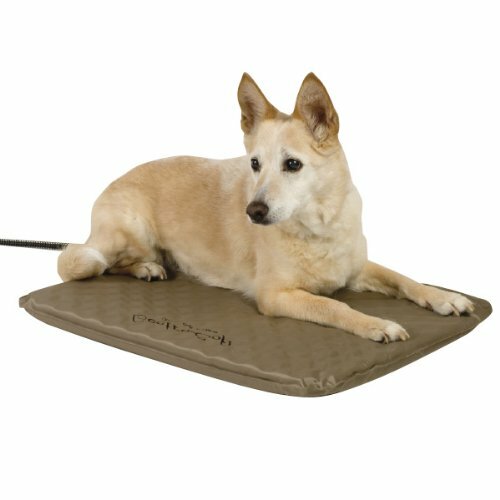 This orthopedic bed is great for dogs that have medical conditions that cause them pain because they help relieve dog’s pressure points with well-stuffed foam filling. 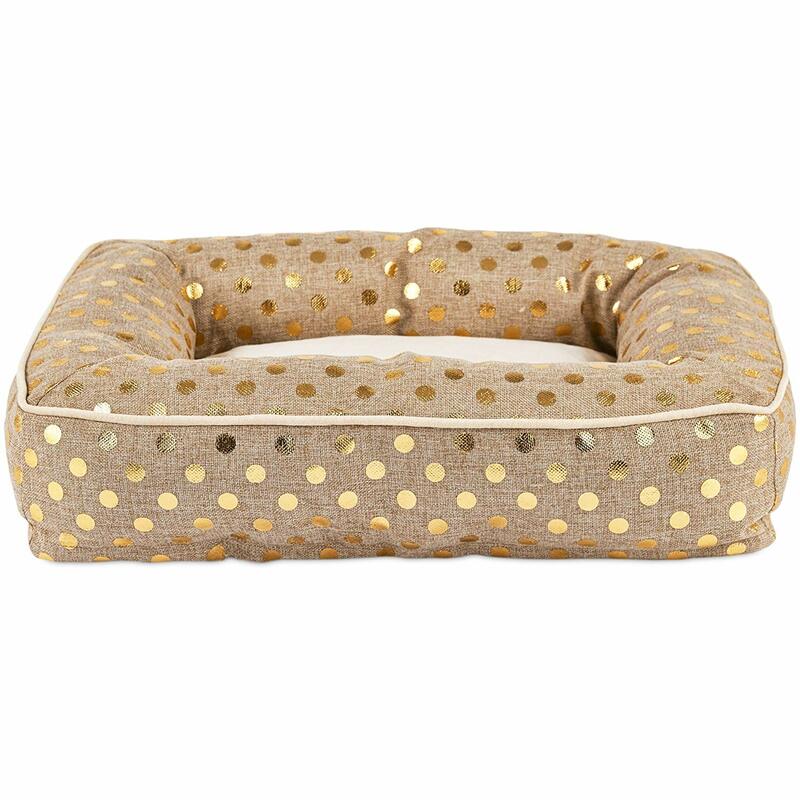 It is a bolster dog bed that comes with a stylish prints and will look nice in any room that you put it. 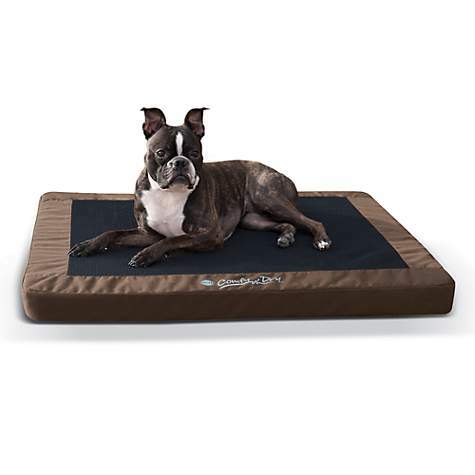 The Harmony Nester orthopedic dog bed is a large bed, 40″ x 30″, making it suitable for any breed. The sleeping surface is ultra-soft and plush, while the cushion is stuffed with orthopedic foam. It has a removable cover that is machine washable. The same thing goes for the pillow. For dogs that sleep outside and don’t have their own dog house, it is important to find bedding that will provide them with higher levels of insulation. It is also important to be moisture resistant bedding. The most popular options for winter time when it comes to outdoor dog bedding are alternative options, not commercial ones. This is understandable since most beds or linens can’t hold off water and can’t keep your dog as warm as wood shavings or grass hay. Check out our quick-facts table, then read on for more details about each option. Using hay as bedding for your dog is a good choice. It is the best outdoor dog bedding for winter because it provides great insulation for your dog, whether you use it in a dog house, a kennel or directly on the ground. This material is an inexpensive and environmentally sound alternative to commercial dog beddings and you shouldn’t hesitate to use it. However, keep in mind that the quality of hay can have a serious impact on the quality of bedding as well. Low-quality hay can expose your dog to health risks since it can become moldy or dusty. It can also be full of allergens. Another thing to keep in mind is that eating hay can cause digestive problems, so try to teach your dog not to eat it if he is one of those dogs who will stuff anything in their mouths. It is also important to change hay bedding regularly during the winter because dogs can track snow and moisture onto it, which can cause mold to appear even though hay is generally resistant to moisture. If you want to try grass hay for dog bedding, choose fresh, clean hay from grasses like big bluestem , smooth brome , Indian grass and Timothy hay. Pine straw is another good choice for outdoor dog bedding. 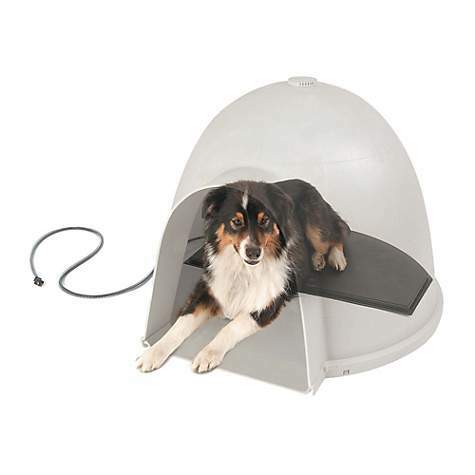 It provides a safe and comfortable environment for your pooch. However, it is not as moisture resistant as cedar or hay, which means that you will have to change the bedding more often to prevent mold from appearing. Another problem comes from the fact that it doesn’t provide odor control like pine or cedar shavings. Even though you could use pine straw by itself, the best usage is to add a layer of pine straw underneath the hay bedding to provide drainage, which you can also achieve with pine or cedar shavings. This is a popular option when it comes to bedding for outdoor doghouses or kennels. Cedar is popular because it repels insects with its smell. That is why a lot of people use cedar as a filling for dog beds, not just for outdoor bedding. However, this strong scent can also cause problems for dogs that have allergies or respiratory problems. Cedar is also dangerous to dogs when ingested, so avoid using it for bedding if your dog is a chewer since it can cause gastric upset or blockages if swallowed. If you want to use cedar, you might want to consider using it as a bottom layer, then adding some grass hay on top of it. If the climate is warm, you should choose something that can cool your dog off during the day. Even though most beds are not a good choice for outdoor use since they will get exposed to elements, there are also a few good options you can choose among them, especially to use during the summer. Check out the features of two of our top choices. Plus, don’t miss our top picks for the best waterproof outdoor dog beds. This cot style dog bed is one of the best choices for outdoors, but it can also be used indoors as well. It is an elevated dog bed with a stable and sturdy steel frame. The bedding is made out of durable and strong fabric knitted to last a long time and provide protection from extreme temperatures. It has breathable quality since the fabric is made to let the air go through. What makes it ideal for outdoor use is the fact that mold and mildew can’t do anything to it. The Coolaroo dog bed is also mite and flea resistant. The design is nice, although it is not as stylish as some of our previous, indoor choices. However, it is very comfortable and your dog will love it. It will take him some time to gets used to it and realize how much better it is to lie on this bed than on the cold or hot floor. As far as cleaning goes, a simple hosing will do the trick, which is probably the easiest way to clean something. One noticeable flaw is installation since the bed comes unassembled and you have to do it yourself. On the other hand, it is a very affordable option, so I guess taking some time to put it together will not hurt as much. The K&H Comfy n’ Dry beds provide great orthopedic support for dogs. In addition to this, they are ideal for outdoor use since their core is completely waterproof. They come with a removable water-resistant cover as well. The cover is machine washable and also treated to resist UV rays, which protects it from fading. Your pooch will be able to enjoy the sun as much as he wants. It has a non-slip bottom which will keep in always in place. Its mesh center and polyester edge have a breathable design that allows air to circulate around your dog. This bed is available in multiple sizes which means that it is a great fit for most dog breeds. The price is very affordable compared to other similar beds, although it does lack a bit in the style department. I already mentioned grass hay, cedar chips and pine straw, which are great for dog house bedding during the winter, especially when you put a blanket over them. You can also put a bed in your dog house to make it even warmer for him. Mats and pads are also a good choice. We are CLOSED today due to the storm ❄️ be safe! (Good day for doggie duvet! #mollymuttbed ) #winter 🐾 see you tomorrow! If you are looking for a highly-customizable option that will allow you to make a bed for your dog according to his specific needs and your taste, this duvet is a great choice. It is actually a duvet cover that you can stuff with anything you choose. Your old clothes and other soft materials will suffice. It is made out of 100-percent cotton that comes in multiple stylish and beautiful patterns you can choose from, like this La Vie en Rose pattern . You can find more patterns here and choose the size that you need. The duvet cover is very durable and machine washable. This is a more affordable option than buying a dog bed. This is one of the best dog beddings for a dog house since it is so easy to clean and you can stuff it with anything, including grass hay or pine straw to make it perfect for cold weather. It is also a good choice for indoor dog bedding as well since it is very stylish. Don’t worry, you don’t have to live in an igloo to use this amazing pad. It doesn’t even have to be as cold as it is in the North Pole, but it sure can provide your dog with enough heat to keep him warm even there. The K&H lectro igloo-style heated pad is a round-shaped bed made specifically for round or dome shaped doghouses, which have become quite popular over the past few years. Of course, you can also use it indoor as well, it is lightweight and you can easily transport it inside when necessary. This pad has an internal thermostat that heats up to your dog’s body temperature. It also comes with a steel-wrapped cord, protecting it from chewers and keeping your pooch safe. You can also buy a removable and washable soft cover for this pad here. In the summertime, when the weather is hot, your dog needs something to help him cool off when he hangs out in his dog house. Here are some of my favorite cooling dog bedding picks for dog houses. If you want to be sure that your dog is cool and comfortable in his dog house during the summer, this Pet Therapeutics cooling pad is a great choice for you. This pad uses CoolPhase gel cell technology that absorbs and disperses excess body heat. It is made out of memory foam to provide comfort, as well as support that can ease your dog’s arthritic and joint pain. It is tested for safety and toxicity and doesn’t require filling with freeze or water. With this pad you will get a washable cover that is also tear resistant. Keep in mind that this pad can only be spot cleaned. It is perfect for dog houses, kennels and crates, but you can also use it indoors as well. This cooling pad by The Green Pet Shop uses a patented gel technology cushion that is pressure activated to cool off your dog on contact. Perfect for warm, summer days and doesn’t even require refrigeration or electricity, nor it has to be refilled with water. It simply recharges automatically after some 20 minutes without use and is ready to go right after. Even though it is good for dog houses, it is also portable and lightweight. You can fold it and fit it into your car without a problem. You can get this pad in all sizes, from small to extra-large. This pad provides treatment for pain, discomfort, swelling and it is perfect for older dogs with health issues. If your dog spends a lot of his time in his crate or sleeps in it as well, you need to choose great bedding for him. Look for lightweight and portable bedding. That will allow you to take it with your crate if you go on the road or if you move. Here are two of the best dog bedding choices for crates! One of my absolute favorites. This dog crate bed can provide comfort and luxury for your dog that will make his crate feel like a house. The Dogbed4less orthopedic dog bed is filled with hypoallergenic memory foam that can relieve your dog from joint pain or arthritis ache. It has therapeutic abilities and provides pressure point relief. The sleeping surface is always cool and comfortable. This dog bed comes with one internal, waterproof liner and two external covers that are machine washable. One is made out of denim and other is waterproof. It is a very durable option that lacks certain charm because it is not very stylish. You can get this bed in many sizes, from medium-small to extra-large and jumbo. Once again, I focused on performance rather than on looks for this crate dog bed. The AmazonBasics padded dog bed is a rather simple design for this bed, but the price reflects this as well. It is one of the best affordable choices when it comes to crate dog bedding, so don’t hesitate to take a chance on it . You can get it in six different sizes. Each size has a soft fleece cover and a polyester cushion that is very comfortable. It is designed specifically for crates and kennels since it has an integrated loop on the edge of its base that allows you to secure the bed to your kennel or crate. This bed has a soft, comfortable rim where your dog can rest his head if he wants. It is machine washable and very lightweight, allowing you to take it with you on the road. Along with your pooch, of course, unless you want to try this bed out yourself. Since kennels are often placed outdoors, I decided to provide you with two completely different options – one for hot weather and one for cold weather. Outside kennel will easily feel like it is inside with these beddings. 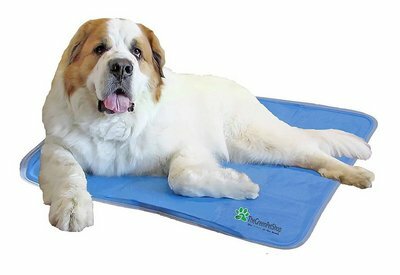 The K&H Lectro-Soft heated bed is a soft and orthopedic bed that provides a lot of warmth during the winter for your dog. Made with orthopedic foam, it is a comfortable, waterproof and durable option available in three sizes. This bed comes with a thermostatically controlled heater which is energy efficient since it uses only 40 watts. It also can’t exceed the body temperature of your dog. This feature ensures safety for your pooch. It is easy to clean since wiping it with a damp rag is more than enough. However, remember to let it dry before you plug it back in. A removable free fleece cover comes with the bed, which is machine washable and provides additional heat and comfort for your dog. This pad by Arf Pets is another self-cooling dog pad on my list that comes in two sizes and provides relief from the heat and extreme temperatures up to 3 hours. After that, it will automatically recharge for 15-20 minutes. This pad uses innovative gel technology to cool your pooch off. That means that it doesn’t require any water, electricity, refrigeration – it is a completely self-charging pad. Since it is made from nylon, it is a much safer option than latex dog pads you can find on the market. It is an environmentally conscious option as well. It is lightweight and easy to fold, so you can use it indoors or on the road. This pad is also a good choice for dogs recovering from surgery or older dogs suffering from arthritis or other painful ailments. You can easily clean the pad with a mix of water and mild soap. Remember to let it dry afterward. The exterior of the Arf Pets self-cooling dog pad is also resistant to tearing, making it extremely durable and long-lasting. I hope that you have found this useful and that you will listen to my advice. If you go with one of these options you will certainly provide your dog with the best dog bedding for his comfort and health. Do you have any thoughts on how to choose the best dog bedding? Share below!